SHANGHAI (Reuters) – Most Asian shares crept higher on Wednesday following a firm Wall Street finish, but gains were curbed by weak data in the region and intensifying fears over volatile Sino-U.S. trade relations. Global markets had inched higher on Tuesday, helped by a Bloomberg report that the United States and China were seeking to resume trade talks to defuse a battle over import tariffs. However, later reports that the U.S. plans tariffs of 25 percent on $200 billion in Chinese imports injected some uncertainty back into financial markets, with the and the Australian dollar lower, and China shares down. A source told Reuters that an announcement on Washington’s tariff plans for China could come as early as Wednesday. The seemingly contradictory signals on U.S.-China trade are puzzling for investors, said Ryan Felsman, senior economist at CommSec in Sydney. “It’s a little bit confusing, but really I think markets are … focused more broadly on the earnings season that’s going on in the U.S., and also Australia is about to begin its corporate earnings season,” he said. In Asia, MSCI’s broadest index of Asia-Pacific shares outside Japan was up 0.1 percent, while Japan’s stock index gained 0.7 percent. S&P E-mini futures were down less than 0.1 percent at 2,815.25 after earlier edging higher. The Taiwan weighted index rose 0.3 percent, with tech shares getting a boost after Apple Inc (NASDAQ:). beat Wall Street expectations for its quarterly results thanks to robust sales of its top-of-the-line iPhone X. The company’s shares rose 3.4 percent to $196.80 in after-hours trade. But shares in mainland China dropped, erasing early gains, with trade war fears and newly released manufacturing data pointing to a cloudy economic outlook. China’s manufacturing sector grew at its slowest pace in eight months in July, dragged down by declining export orders, a private survey showed on Wednesday. 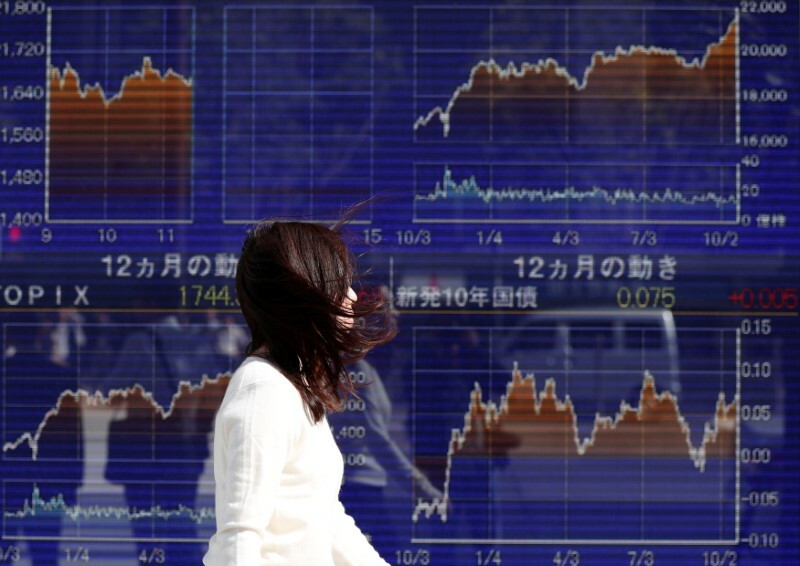 The index fell 0.3 percent, while the blue-chip CSI300 index lost 0.4 percent. Data from Australia also showed a slowdown in manufacturing activity in July, with the Commonwealth Bank/Markit purchasing managers index at its lowest level in nearly two years. Australian shares were flat, with some support coming from miners ahead of expected strong results from Rio Tinto (LON:) later on Wednesday. Policy meetings of the U.S. Federal Reserve on Wednesday and the Bank of England on Thursday will also keep some investors on the sidelines, although the U.S. central bank is expected to keep rates unchanged. While U.S. rates are widely expected to be held, “investors are more likely to be concerned with any potential tweaks in the language of the policy statement. Buying sentiment toward the dollar could receive a boost if the central bank strikes a hawkish tone,” Lukman Otunuga, research analyst at FXTM, wrote in a note. The yield on benchmark 10-year Treasury notes was at 2.9728 percent, compared with its U.S. close of 2.964 percent on Tuesday. The two-year yield, which rises with traders’ expectations of higher Fed fund rates, touched 2.6735 percent compared with a U.S. close of 2.669 percent. The dollar was flat against the yen at 111.85, but rose 0.31 percent against the offshore yuan on news of the Trump administration’s new tariff plans. The Australian dollar fell 0.15 percent to $0.7417. The euro was down 0.1 percent on the day at $1.1682. The , which tracks the greenback against a basket of six major rivals, gained 0.1 percent to 94.606. Meanwhile, oil prices fell on industry data showing an unexpected rise in stockpiles. The slump in crude prices comes after their largest monthly decline in two years in July. U.S. crude dipped 0.6 percent to $68.37 a barrel, while gave up 0.4 percent to $73.92 per barrel. fell 0.16 percent to $1,221.40 per ounce.